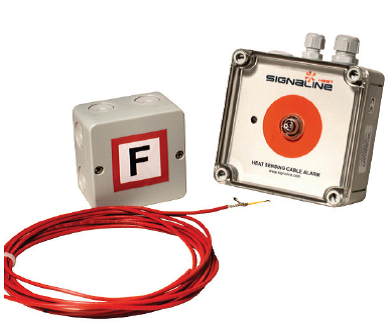 Signaline Analogue Heat Sensing Detection Cables for Fire & Safety Applications. 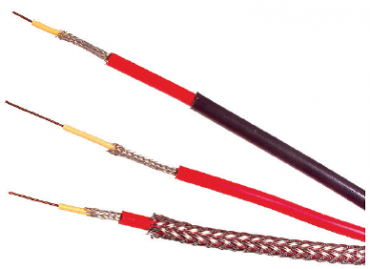 – Analogue heat detection cables for fire protection. – Detects rise in temperature. – Cable resets once cooled. – Low cost, easy to install and reliable solution. – Applications: Fire detection in cable trays, escalators, warehouses, factories and car parks. – Full range of installation accessories. – Conductor Resistance: 2 ohms/100m @ 20 degrees Celsius. – Temp Range (degrees Celsius): -40 to +70. – Alarm Temp Range: typical – 1m alarm range 70 to 125 degrees Celsius, – 10m alarm range 45 to 100 degrees Celsius. LGMHD01 Red PVC outer sheathe, 5mm min. bend radius, 1.6kg per 100m. LGMHD01R Black Chemical and UV resistant Nylon outer sheathe, 18mm min. bend radius, 2.2kg per 100m. LGMHD01S Red PVC with stainless steel braid outer sheathe, 20mm min. bend radius, 3kg per 100m. LGMSKM03 Analogue cable controller, 24VDC, 2 x CO contacts, IP65, EN54 compliant, 110 x 110 x 65mm, 0.27kg. LGMUCB Universal connection box (suitable for use as end of line, interposing line unit or junction box), 94 x 94 x 57mm, 0.5kg.